security of the poor through agriculture price support, public stockpiling of grain and subsidised distribution of food among the poor people before the Trade Facilitation Agreement (TFA) takes over. They also said that along with the G-33 countries India is leading the fight in WTO in favour of the developing and least developed countries and we should support it. The press conference express solidarity with the garment workers in Hunger Strike until death for their due salary and benefits since the Eid Day. It is expected the government would take action to release all the due salaries in no time. The press conference titled “Trade Minister to stand for the permanent solution for food security and agriculture raised by India in WTO: Food and Agriculture should out of profit led trade” held in Dhaka today is moderated by Rezaul Karim Chowdhury of EquityBD while Barkat Ullah Maruf reads out the written position paper. 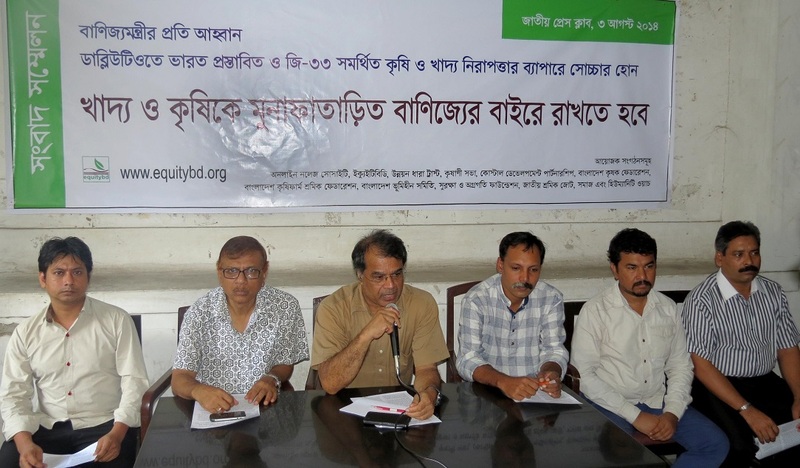 The other speakers are Aminur Rasul Babul of Unnayan Dhara Trust, Jibanananda Jayanta of Surokkha O Agragoti Foundation, Shobnom Hafiz of Somaj, Mustafa Kamal Akanda of EquityBD and Shibly Anwar of Labour Resource Center. The joint organizers of the press conference are Online Knowledge Society, EquityBD, Unnayan Dhara Trust, Krishani Shova, Coastal Development Partnership, Jatyio Sromik Jote, Bangladesh Krishok Federation, Bangladesh Krishi Farm Sromik Federation, Bangladesh Vumihin Samity, Somaj, Surokkha O Agragoti Foundation and Humanity Watch. In the written speech Barkat Ullah Maruf said, if Trade Facilitation Agreement takes place there will be no Duty Free Quota Free (DFQF) market access in the near future. But LDCs like Bangladesh are repeatedly given false pledges of this unreal DFQF in exchange of TFA though these countries and their poor people have no benefit from the TFA. This is how WTO is serving the developed countries and their giant companies. Jibanananda Jayanta of Surokkha O Agragoti Foundation said in his speech, the famine in 1974 broke out in Bangladesh was solely due to the international food politics that killed several hundred thousand people. He also said, we shouldn’t trust the developed world anymore for they broke their promise every time. In the implementation of the MDGs we achieved several goals but developed countries completely failed to keep their promise of international cooperation for development. So, there is every chance of breaking the promise once their interest of TFA is fulfilled. Aminur Rasul Babul said in his speech, Bangladesh delegation didn’t support the food security issue raised in the WTO’s 9th Ministerial in Bali for the hope of the DFQF market access for the readymade garments to the developed countries. But we should say that we failed to figure out the importance of the food security and our agricultural rights over the false hope of DFQF. Rezaul Karim Chowdhury in his speech said, Bangladesh is losing 88 thousand hectors of agricultural land every year due to river erosion, climate change, urbanization and unplanned developments of roads and highways. On the other hand, he said, our population is increasing. We are afraid to imagine how we’ll achieve the food sufficiency for the heavily increased population after 20 years. What if other countries deny selling food grains even if we have enough money? He said, therefore, agriculture and food security is the most important issue for us right now and we should support the Indian call in WTO without any hesitation.